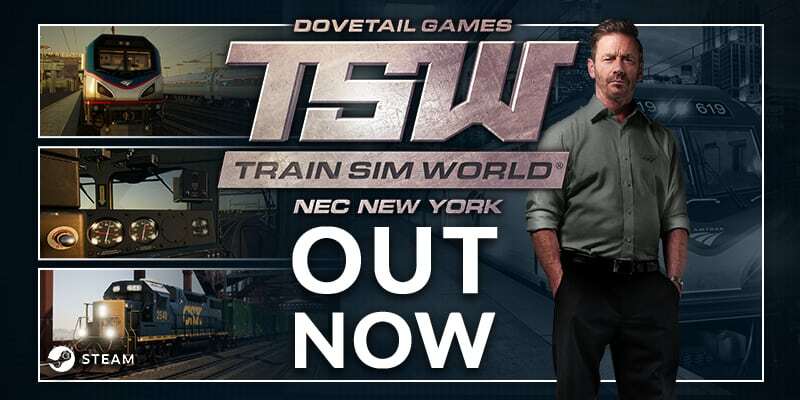 Tsw: Northeast Corridor New York – Out Now! Discussion in 'Dovetail Live Article Discussion' started by TrainSim-Jay, Mar 20, 2018. Our next expansion for Train Sim World, entitled Northeast Corridor New York, is Out Now for Windows PC, and reproduces the famed “NEC” for modern Amtrak and CSX “Big Apple” railroading! Well now it's time to see if DTG will surprise us with something good, or if this route will be the big fat flop that a lot of people think it will be. I just left Penn Station northbound and so far it's not looking good at all. If they're going to update this route, they had better do it as soon as possible, because so far this is just a disgrace. Maybe later. I want to play more of the route and make sure I see everything before I give my feedback. Some immediate issues however are the fact that the catenary supports between Sunnyside Yard and Newark Airport look too new. These supports were installed in the 1930s and have since turned a rusty dark brown color. Also, there are a few problems with Secaucus Junction. First of all, Amtrak trains do not stop at Secaucus Junction. It is an NJT station only. I can understand wanting a few Amtrak trains to stop there if there are no actual NJT trains operating on the route, but it shouldn't be every Amtrak train. Also I noticed that it rains inside Secaucus Jct Station. Also at one point, I was riding a train to New Rochelle and just before the Pelham Bay Bridge, I noticed that the catenary had disappeared. I don't know if this was a graphical bug (like how the track sometimes disappears in GWE) or if the catenary was just never put there when making the route, but it looked absolutely horrible. Also a bridge over a road in that same area (again, about a mile or two before the Pelham Bay Bridge going north) disappeared as well and the tracks were just floating in the air above this road. Other than that, I haven't seen anything major so far, so I'm going to keep playing the route and most likely post my full thoughts tomorrow. I can say one thing right now though. This route does seem unfinished so far and it still needs a lot of work. You touched on some very good points. The catenary is much to new looking. what a waste of money im tired of dovetail putting out crap. this dlc has no freight services and the passenger services are all repetitive. I will no longer be spending any of my hard earned money on dovetail games. you lose a customer for putting out crap. "Hey devs, instead of wasting money on quality control and proper research, just crank this route out as soon as possible and then go right onto the next one so we can squeeze more money out of these idiots." Corporate greed ruins everything and in this case, it ruined a potentially good NEC route. If it wasn't for Steam's ridiculous 2 hour return policy, I would ditch this garbage route and get my money back. At least I didn't pay full price for it. The route is very good! I don’t know what you are talking about. I agree here there is nothing wrong with the new route added. The buggy signaling system is being fixed. The signaling system is broken (I hope it's being fixed), the catenary looks horrible and completely inaccurate except on the Oak Point-New Rochelle section, there are no freight services in service mode (yeah I know they'll hopefully be added in later, but it's something that should have happened at release), Amtrak trains are too frequent, the track has wooden ties in the wrong places, all Amtrak trains stop at Secaucus Jct, there's this weird bug where the catenary disappears on random sections of the route (I mean the wires, the supports, everything), there's bugs where the track sometimes floats in the air where there should be bridges, and worst of all, the route is too short. I still say they should have done the first long route in the game and given us the route between New York and Philadelphia, even if it would mean waiting longer. Now I understand some of these problems might be fixed in the future (you never know with DTG), but I still don't think the route is worth the money. I will say a few positive things about the route though. The scenery around the tracks is very nice, I really enjoy the freight scenarios, the sounds are decent (I love the flat wheel sound on the Amfleets), the ACS and Amfleet cars were modeled perfectly, both on the interior and exterior (I ride the Keystone Service a lot, so I know the interior of an Amfleet I coach). the stations are modeled very nice, the position light signals look beautiful, the lighting in the Hudson and East River tunnels looks really cool (although the lights in the tunnel are not on for some reason, and the view going over the Hell Gate Bridge is amazing. Still though, the bad outweighs the good in my opinion. I hope you all pre ordered, because I really do not recommend buying this route at full price, if at all. At least until they fix the major problems...if they fix any major problems. The signaling system is being fixed. They are currently unable to build longer routes. They are not really unable to build longer routes, it just would take much longer. I'd be willing to wait. I really don't care at this point. I had an issue with the TSW not Saving the Scenario in NEC Terminal Switch. I save and then the next morning tried to play Last played and it crashed the Sim. I haven't accomplished any other Scenario yet to see if this is an isolated problem with just one Scenario. Besides the signalling system, its all fine, performance is great too! They are currently fixing the signaling system. Yeah, i heard. I'm actually happy that DTG is listening. People need to stop complaining that it isn’t perfect at release. Nobody expects it to be perfect, but it should have been better than it is at release. It’s getting fixed, and no body seems to care. John, I absolutely can see this issue from your perspective. This route has both its positive and negative aspects to it and to say there is absolutely nothing wrong with the route is totally false and does a disservice to the game. As both consumers and fans of TSW, we have to remain critical of the product we receive and to acknowledge it's flaws isn't inherently a bad thing. Dovetail seems to be more on top of things with this release seeing as they released a known issues thread themselves with items they plan to fix and are actively taking feedback regarding the audio issues the sim is currently plagued by; an effort I applaud personally. You're opinion of the game is no less valid than anyone else's and I thank you for sharing both your likes and dislikes in your earlier post. It's constructive criticism that will help mold this game into what it both deserves to be and what we deserve from a game as consumers. If you don't believe the route is worth the money, that is entirely your prerogative. I will never tell someone how to spend their money or tell them what their money is or isn't worth. That decision is subjective and personal. I see my purchase of the route and every other piece of content for this game as an investment into this game's future. I want to see it be better and I want to be able to provide the resources I am capable of providing to see that dream fulfilled. Whether or not it's a fool's errand, no one can say for sure but I have very high hopes for this franchise. I hope we can all come together as a community here and help further this goal together! I feel that this is the best DLC for TSW that they have released. I would be hard pressed to argue against that. I am enjoying this route as well and I see it as a great starting point towards something truly amazing that we as a community can be proud to own. I'm glad you are also enjoying the route! Well then that's good for you, because it was well worth your money then. One thing I do have to clear up for you though and apologize about is that I live along the NEC and I'm very familiar with the whole route. Even the tiny details like the type of ties they use in certain areas or the style of the catenary supports. As a result, I am VERY judgmental on NEC content and when they get it wrong, I'll point it out to them. Now most of my hatred of DTG doesn't come from this route, but from many unpleasant experiences I've had with them in the past and how incredibly ignorant and stubborn they can be. I feel that people shouldn't spend money on this route yet because it's pretty much unfinished. Yeah, they might be working on completing the route, but it's all stuff that should have been included at release. And DTG aren't really into updating their routes, unless it's something absolutely major at the very beginning of a route's life. Their mentality is pretty much make a route, release it, and then forget about it and instantly go on to making the next route. I know for a fact that they are updating it. I haven’t even gotten to play it yet. I will tomorrow night through Tuesday morning. Here’s my perspective. While I’m not personally fond of the choice they made doing such a section, the route still does look good. Anything in game form will never be 100% accurate. Sure there may be missing elements that probably should have been put in. But we are talking about a game that is a little over a Year old that will be expanded upon for years to come. Like the other individual stated, making an investment into the company is for the intention of supporting them so that they can get better. We have to understand, this isn’t solely a hobby for them. They do have to make a living. And though they probably could learn to address issues that are brought up a little better than they currently do, I believe they are trying to make positive steps in the right direction. Withholding support from them over flaws that can be addressed can prove to be quite counterproductive, though in other scenarios may help put a fire under them and try getting into the habit of putting in the extra effort to get things done right so that it becomes less of a problem to address issues upon release. Only time will tell. But for now, I still am putting my faith in their ability to make this sim we all hope it can be. I do agree with you!! I also agree with what you are saying. Hey so I’m trying to drive this in service mode, and I drive one way and get out and I can’t find a timetable so I have no idea when the next train is coming. Is there a timetable? Check the map and you will see what other trains are moving and their position on the map.